FJ40 Rear Bench Seat that folds forward when not in use. This is a CCOT Exclusive Kit. CCOT has taken the Bestop TrailMax™ II Fold & Tumble Rear Bench Seat and designed a custom FJ40 / BJ40 seat mounting and seat belt system that will safely transport rear passengers in comfort and style. The Fold & Tumble seat design allow you to tumble the seat forward to maximize rear cargo space when seat is not in use. CCOT designed a unique adjustable "prop stick" to securely hold the seat in the upright position to prevent the seat from falling back down when you're driving up steep trails. The prop stick has an adjustable threaded bumper foot that screws in or out to adjust proper tension to hold the seat securely upright. 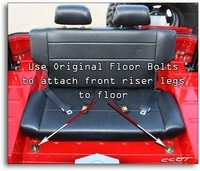 TrailMax™ Rear Bench Seat has dual headrests that will also fit the front bucket seats of most FJ40 factory seats. Atlas Frame is sturdy and resists corrosion. Seats contain Variable Rate of Resistance springs for comfort on the road and support on the trail. Best quality high density closed cell foam minimizes fatigue and maintains the seat shape, ensuring comfort and good looks for years to come. 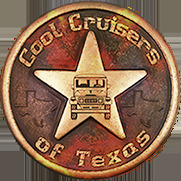 Seats are upholstered in easy care black crush, spice denim or charcoal denim all of which maintain their fit in any temperature and are mildew resistant. Seats also comes with a pair rear seat belts with custom Land Cruiser rear bench seat mounting kit that will also fit most SUVs. This bench seat system can be mounted in the cargo area of the FJ60 or FJ62 and most any SUV style vehicle with at least 40" between the inside wheel wells. 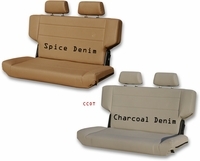 Seats are available in 3 easy care fabrics.